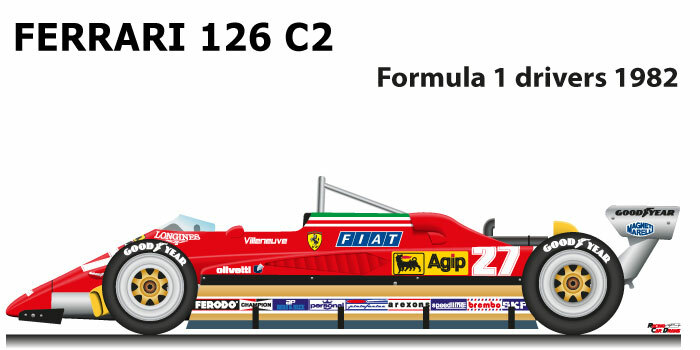 The Ferrari 126 C2 n.27 is a car that participated in the Formula 1 World Championship in 1982. The car was designed by Harvey Postlethwaite and developed in the Pininfarina wind tunnel. After four years of collaboration with Michelin, the Italian team changed tire supplier by fitting the Goodyear tires. Gilles Villeneuve with the Ferrari 126 C2 n.27 lost his life with an accident in the Zolder circuit in qualifying for the Belgian Grand Prix. At the end of the season Ferrari won the constructors’ title, but during the world championship lost its two Villeneuve drivers to Zolder and Didier Pironi who had an accident at Hockenheim that forced him into a wheelchair and could not defend the leader of the classification. The 1982 world championship was won by Keke Rosberg on the Williams FW08.